Firstly there has been defence (in comments there) of Prof Wadhams after he was reported in the press as stating that he had suspected that someone might be assassinating leading sea ice scientists. The story was initially reported in the Telegraph (and others), for example the following quote from the Telegraph. Asked if he thought hitmen might have been behind the deaths, Prof Wadhams, who is Professor of ocean physics at Cambridge University, told The Telegraph: “Yes. I do believe assassins possibly murdered them but I can see that I would be thought of as a looney for believing this." Now, as reported by Stoat (sourced from the Grauniad), the IPSO has ruled against Wadhams finding that he was accurately quoted, that consequently he had no right to reply, and that he was fully aware that most of his statements were on the record. Notably, in a 30 minute 'on the record' segment of the interview, about 20 minutes concentrated on Wadhams' bizarre conspiracy theory, this was not just a throw away comment. Next, Tamino has used change point analysis and finds that in the annual average after a decrease from 2003 to 2007 the post 2007 has seen a flattening, while in the September extent there is a loss rate change after the mid 1990s. This September extent loss starting in the late 1990s reflects the findings of Lindsay & Zhang. This data needs careful consideration to explain why the two metrics are different, I'll probably have a look at this issue in the future. On a lighter note Tamino also rubbishes some dolt who has been re-posted by the swivel eyed loons in the GWPF, using cherry picked data to claim a recovery of Arctic sea ice. Such stupidity leaves me bereft of words. 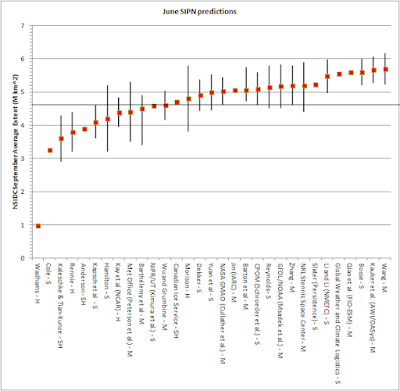 Now to the main reason for this post, the Sea Ice Prediction Network results. I posted my prediction on 27 June, which used April PIOMAS data, so could have been posted in early May, it will be next year. My prediction was for a September minimum of 5.15M km^2 +/- 0.64M km^2. The same prediction was entered for July and August, with the qualification that I expected the final result to be in the lower half of the range. NSIDC monthly extent for September has now been posted, at 4.63M km^2 this is comfortably above the lower bound of my prediction (4.51M km^2). Looking at the overall pattern it has been a good year for success in SIPN, with the September minimum falling within the bulk of predictions sharing a common range being successful, albeit at the lower end of the range. This year's actual minimum is marked by a black line at 4.6M km^2. That 2015 ended at the lower end of the range of that bulk overlap of predictions is not surprising due to the strong dipole that dominated July. 2015 has settled suggestions of a possible rebound, there is no rebound or recovery, the trend of sea ice loss continues downwards, this is supported by the success of Hamilton's SIPN prediction which is based on a linear fit to September extent. For the sake of completeness, in the post detailing my SIPN prediction I also made a prediction for Cryosphere Today Area, the 2015 daily minimum was 3.09M km^2 on 9 September. The prediction from late June was 3.0 to 3.8M km^2, so this was successful, although again at the lower end of the range. By the way, what happened to the multi-year ice? Did all of it melt out, as I believe most of it did? If so, could that mean a much lower minimum for 2016? As of August there was still a bulk of thicker ice in the Central Arctic. I don't have gridded data for September yet, but with September having a similar area to 2010, and being a bit higher than 2007 and 2011, yet overall volume on the date of minimum being substantially higher than in 2010 and 2011. I do not think the thicker MYI has gone, and I suspect it will reduce inroads into the Central Arctic next year, depending on how much is exported into the Beaufort to ESS region. Some scientists may not answer if they think points are raised that are already covered in their papers, or if you are disagreeing with them for reasons they feel would be addressed in the literature. Thanks for the reply on the MYI. I heard back from Ed this morning, and he told me he suspects the methane spike over the past year may be due to increased emissions from microbes in wetlands. Interesting, but it makes sense now that I think about it. I sent him a follow-up for clarification and see what he says. Was it unusually warm and wet over the region? Do you know how to use NCEP/NCAR? Does the data you have access to allow you to see when spikes of CH4 being added to the atmosphere happen? Could this be tied with warm wet weather? I'm not sure how to figure out if it warm and wet, but I can tell you Ed got back to me again. He said the increase in global mean methane was primarily due to increased microbial CH4 emissions from wetlands globally, and that hydrates don't really play a role. He also said there has been no real changes in Arctic CH4 emissions. As far as future risks go, he's more concerned about thermokarst emissions than hydrates, but how much more thermokarst emissions is hard to say. So all in all, methane emissions will continue to go up, but not by gargantuan levels. I'll ask about the warm and wet conditions. Don't bother Ed on my account, he's busy and it's just my half arsed amateur musings that are probably wrong - it's not a subject I have studied. When atmospheric CH4 first began increasing again in 2007, the Arctic was very warm. We described that in the attached paper. Based on estimates of emissions by atmospheric transport models since then, there were enhanced emissions in the Arctic in 2007, but since then (at least through 2012), Arctic emissions have been at or below the long-term mean determined by the models. The amount of precipitation is also important, and 2007 was wet. For 2014, I have not looked at it closely yet, but a preliminary look at our data suggests enhanced emissions in the Arctic again. In both cases, these enhancements were relatively small compared to what is found for the tropics. I know that some process-based models of wetlands include thermokarst lake formation and emissions of CH4 from them, but it is difficult to model such processes. If the frequency of large fires increases, CH4 emissions will increase with them. Keep in mind that while permafrost contains a huge amount of carbon, it is not CH4. It becomes CH4 when the permafrost melts and microbes consume that carbon in anaerobic environments. For fires, some CH4 is produced, along with CO and CO2, through incomplete combustion. As these wet areas dry, they become sources of CO2 rather than CH4. I thought this melt season went pretty much according to expectations. Back in May I commented, "I'd vote for an average September extent of 4.59 Mkm^2." Though I did think it might go a little lower. I think the latest PIOMAS release already shows what we might expect next year. The 'sideways' fall refreeze has almost always been accompanied by another drop in volume the following year. Volume drop is also correlated with extent and area decreases. The ice is sitting pretty much about where it was in 2009. If this winter proceeds the way the 2009/10 winter did, then I wouldn't be surprised to see a 2010 type drop - taking volume close to the edge of the 2SD band again. Area and extent would be close to new lows (though likely still higher than 2012). P.S. - preceding comments were made by eyeballing the PIOMAS graph - not looking at a spreadsheet. Given my eyesight my comparisons to 2009 and winter 2009/10 could be off by a year. Mainly I'm looking at fall refreeze on PIOMAS, the pattern of sideways refreeze (as opposed to a sharp incline up) and the following year's volume at minimum. 2009/10 was a rather extraordinary winter with a reversed polar vortex and strong Beaufort High. I don't expect such a massive and strong export from the Central Arctic this year. However I would not rule it out, it is too early to say anything about prospects for the winter. Similarly I see 2012 as more strongly influenced by the GAC of 2012 than for example Zhang does using PIOMAS, I have explained why here. My hunch is that 2012 was an extreme low outside of the typical envelope dictated by April thickness. Likewise 2013 and 2014 tell us what summer looks like with poor melt weather and poor dipole activity. As I don't expect a strong trend of April thickness decline through this decade I expect that years 2007, 2008, 2010, 2011, 2015, represent the sort of typical seasons we will see throughout the rest of this decade. My guess for next year is 4.3 to 5.0M km^2 September extent. My guess for years 2016 to 2020 is that the range 3.5 to 5.5 will encompass those five years. 2015's September extent means that both Larry Hamilton's 'naive' trend fit to Sept extent has been successful, and that my prediction using April PIOMAS Volume has been successful. Both methods use data from 1979 to 1914. This suggests to me that in terms of those two methods, past behaviour remains a reasonable predictor and they do not support the interpretation of a presage to a rapid crash. Perhaps I should start a thread at the forum? Thanks for the info Dreesen. You can add in my CT Area prediction, using a different dataset, and different technique... That was successful too.